This entry was posted in Uncategorized and tagged Anglican, Bible, Disciple, Bible, Christianity, Disciples, discipleship, Episcopalian, fishers of men, Galilee, Gospel, Jesus, Religion, Vocation. Bookmark the permalink. Great post. When I first accepted Christ as my Savior I too began to leave things behind. The most amazing part was that no one told me what I needed to change or what behaviors were not pleasing to God…it was His voice within my heart that made me want to be better. I am so thankful I listened to His voice. And it is a blessing to listen to His voice through you today. I think leaving some things behind is a very hard part of our Christian walk. It can be a great challenge, and leaning on each other is a significant part of the journey. I’m so glad you liked it, Linda. Sometimes, I think I sound too much like myself. I agree. May it be so with us. That’s my hope….and my prayer. A wonderful post for the beginning of the year! Thank you so much for your good and constant kindness. I think that’s precisely right, and exactly the notion of conversion. 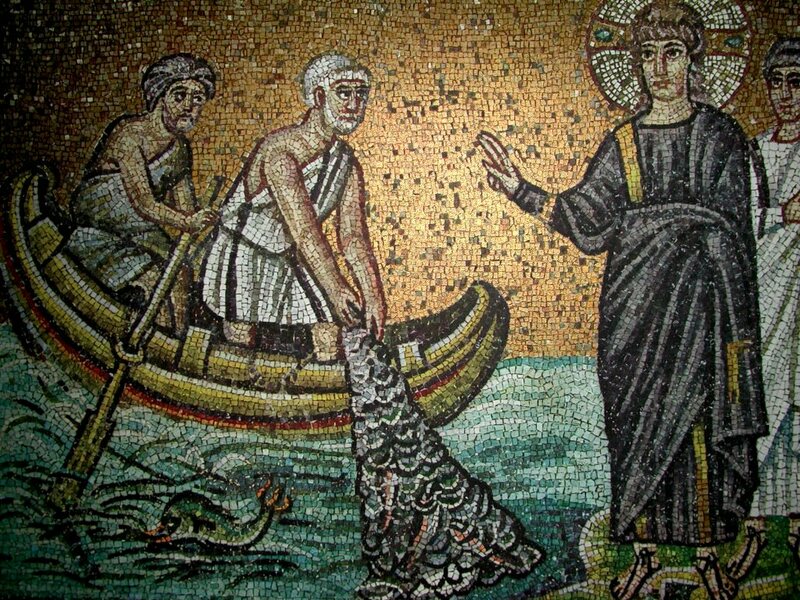 I think it was well they left their angling jobs behind as, in the wonderful mosaic above, there is a very pesky looking fish under the boat. After an intense weekend retreat I am left feeling that I have not so much left something behind but Jesus has reached in, pulled it out and made me face it before I could let it go. It was not something I expected to come up but all is well subsequently. I’m glad your retreat was intense, and hope you find some time to decompress. I’m glad you’re at peace with what happened there. We do struggle so, don’t we? I know, I’m a struggler from way back. Give yourself some time, my friend. Good words, James. Thank you. You make an important point that we each have to make the journey but we do so in community and relationship with others. I think we need to recover an understanding of and emphasis on our faith as personal but not individualistic. I know that I need friends for the journey, and I’m glad to call you my dear friend.